A common refrain in discussions around board of education tables is “we must focus on students in our decision making” and “this is in the best interest of our students.” Yet, many school districts have not taken the next step, which is to directly involve students in decision-making. Of course, many school districts are engaging students in a variety of ways. Schools boards have student trustees, for example. Some have student leadership councils that provide input. Others have representatives from secondary schools who come together for the purpose of providing boards with their views on specific topics. It teaches students the value of democracy. Learning about democracy in Social Studies is important, but participating in meaningful democratic processes is more revealing in terms of the complexities and consequence of democracy. It helps students develop leadership. Being active in an important leadership role is the best way to develop the knowledge, skills and attitudes involved in actually leading. There is considerable evidence that student engagement and achievement improve when students have a real voice. Student input can improve decisions and the quality of decision making in a school district. They have a perspective that is unique. The article goes on to say that there is no good reason not to include student voice and it would be hard to argue that point. However, finding ways to include student voice is not without its challenges. School districts and boards find that it is sometimes difficult to find “authentic student voice” in their processes. Critics say that the students who become involved in district processes represent a narrow group of students in the district. Or, they worry that student voice is only tokenism. 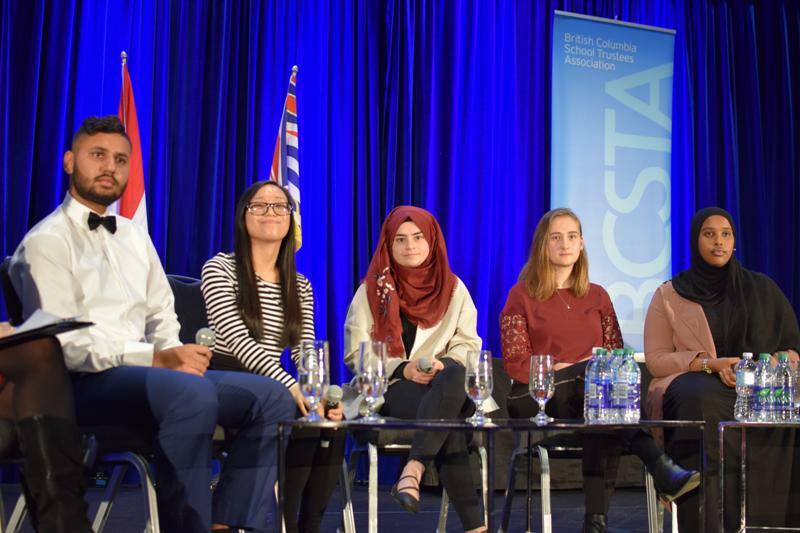 Finding authentic student voice for school district processes was the task set for a group of students at L.A. Mathieson School in the Surrey School District. Mr. Kyle McKillop, a teacher at L.A. Matheson School, was invited to work with Maria LeRose, television producer, interviewer and moderator to explore the question. They set out to engage students to work on this inquiry and to present their findings to the Trustee Academy in 2018. Through a series of questions posed by moderator LeRose, a group of the students presented their findings in a panel keynote on the first night of the 2018 Trustee Academy. Trustees were provided with great insight, both into the process the students had followed, and into the possibilities for this kind of work in their own school districts. Many questions were posed from the floor and the students provided that authentic voice they had worked to uncover. Both students and trustees found the session of great benefit: students learned about the democratic process of boards of education, they gained leadership experience and skills, and they felt more engaged and continued to do so beyond the experience. Trustees left with better information about how to engage students in their own school districts. In designing this work, all those involved wanted it to be more than a one-off project. The idea was to inform the work of other school districts who wish to find a way to include authentic student voice in their processes. To that end, another group of the students involved in this project developed a website. The site features their story and provides information for others who wish to do this kind of work in their school districts. Well worth a visit, the website not only informs, but offers opportunities for others to engage with the student to find out more. Student voice matters and now there is a path, developed by students, to support this work in your school district. Even if you have a student trustee or some other way of engaging student input, there is much to be learned from the experience of these students.